Two teenagers arrested in bus stop robbery. See full msg for pictures of the two teenagers. 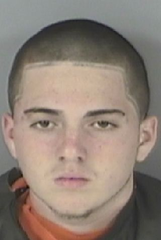 Two teenagers were arrested Tuesday morning following the early morning armed robbery of a Matanzas High School student who was waiting at a Palm Coast bus stop. 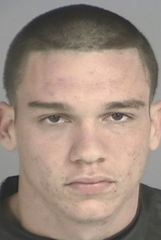 Sebastian Dominguez, 18, 51 Longfellow Drive, Palm Cost and Brandon Smith, 19, 291 Cone Road, Ormond Beach, were being held in the Flagler County Inmate Facility Tuesday. Dominguez is charged with robbery with a firearm and aggravated battery with a firearm. His bond was set at $35,000 on those charges. Smith was charged with being an accessory to robbery with a firearm with bond set at $5,000. He also is being held on an outstanding Volusia County warrant for failure to appear. Bond is $2,500 on the charge. Deputies said two MHS students were waiting for a school bus on Beachway Drive where it loops around and reconnects shortly after 7 a.m., when a truck, driven by Dominguez with Smith as a passenger, stopped. The high school students said the two exited the truck and Dominguez approached him with what appeared to be a gun. The student said one of the men patted him down to find items to steal while the gun was pointed to his chest. At one point, the student was struck in the face with the suspected firearm after making a comment to the robbers. At 7:20 a.m., deputies responded to a crash with injuries on Bird of Paradise Drive, about a mile north of the bus stop. Deputies detained Dominguez and Smith who were later identified by the two MHS students as the robbers. A pellet gun was recovered at the scene and is believed to have been used in the robbery. Two female passengers in Dominguez’s truck, identified as a 14-year-old Indian Trails Middle School student and a 15-year-old MHS student, were slightly injured in the crash. Florida Highway Patrol investigated the accident and additionally charged Dominguez with leaving the scene of an accident with injuries and leaving the scene of an accident with property damage. Bond on those charges totaled $20,000. Sheriff’s deputies are continuing their investigation into the incident and they are investigating the possibility that the truck driven by Dominguez was involved in an overnight vandalism incident at the Indian Trails Sports Complex. In that incident, someone did donuts in a vehicle on the soccer fields, damaging the fields. “These two teenagers are menaces to this community through their actions that endangered many innocent people. The deputies did an excellent job coordinating information from the two crime scenes these two created in Palm Coast today,” said Flagler County Sheriff Donald W. Fleming.